Boothbay Region High School is a typical U.S. high school located in Maine. 40% of students qualify for free or reduced lunch, and in recent years they have had an average of 50-55% of students matriculate to college. Guidance director Jennifer Burns recommended that her district purchase Naviance as a tool to help increase the school’s college-going rate, as well as student engagement in academics and post-secondary goals. Jennifer shared eight things that have changed at her school just one year after implementing Naviance. process of applying to college and planning for careers. Now, all Boothbay students are leveraging the task management tools in advisory periods to plan for life after high school, whether applying to college or preparing to enter the workforce. Data makes all the difference. Jennifer was able to import previous year’s college application history. 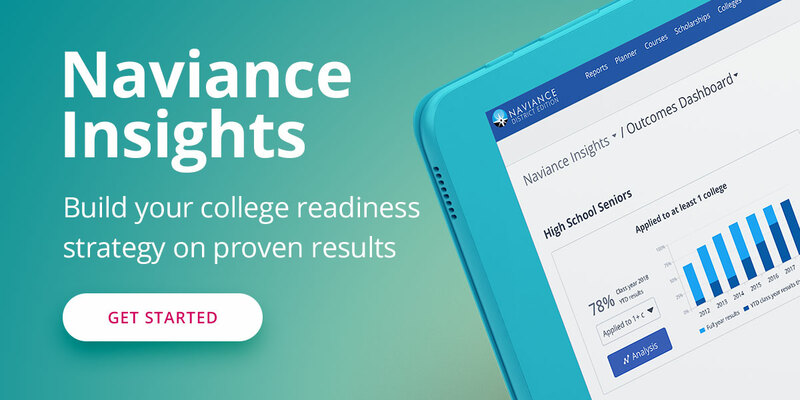 With this data in Naviance, her students can anonymously compare their own GPAs and standardized test scores to classmates in previous years who have applied to the same colleges. Students can now make data-driven decisions about where to apply to college and Jennifer can leverage the data in conversations with students and parents. Until this year, Boothbay did not have the resources they needed to help students identify their career options. Jennifer recognizes that not all students want to attend college, so she wanted to provide resources tailored to those students and students who will pursue careers after college. This year, students in grades 9-11 have especially enjoyed using the Career Interest Profiler and Career Cluster Finder, which pairs students with career fields based on their unique interests and strengths. In the past, students would ask for scholarship information and Jennifer had no single place to direct them. With Naviance, Jennifer is able to provide a one-stop shop for scholarships. She was able to import local scholarships and point her students to this online resource that also includes over three million Sallie Mae scholarships worth over $13 billion. Prior to this year, Jennifer’s students used a variety of online resources to research colleges, but her staff had no way of knowing if students were on track for achieving their post-secondary goals. With Naviance, Jennifer assigns students with sets of tasks so that she and her teachers can track which students have and have not completed important milestones. Students can also manage and create new tasks on the go with the Naviance Student mobile app for iPhone and iPod touch. Like many schools, Boothbay had a very labor-intensive process for sending transcripts and application materials. Jennifer was very pleased with how Naviance eDocs streamlined the process of organizing and sending these documents electronically. She was able to use the time savings to spend more time with students. Boothbay also stands to save money on postage, paper, ink, and staffing hours this year as a result of using Naviance eDocs. This fall, Jennifer conducted a college boot camp by bringing students into the library and walking through the college application process. She was able to point students to Naviance for the resources they would need to conduct research and manage the process.